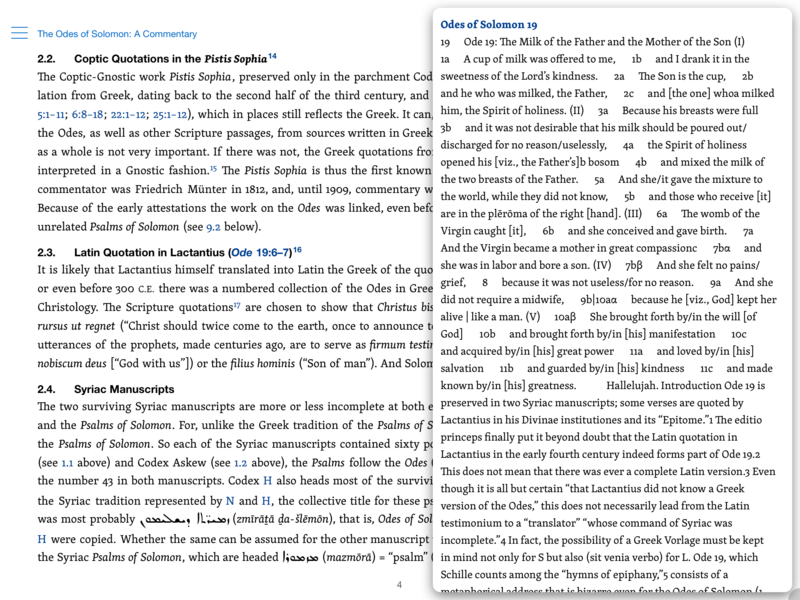 Known until the 18th century only from fragmentary quotations and references in patristic literature, more recent discoveries of Greek, Coptic, and Syriac manuscripts have drawn fresh interest and attention to the Odes of Solomon, a collection of Christian poetry from the second century rich in imagery and exhibiting an exotic spirituality. Internationally renowned expert on the Odes, Michael Lattke, provides a meticulous translation and discussion of the textual transmission of the “Odes,” along with judicious commentary on the place of the “Odes” in the development of Gnosticism, Logos theory, and early Christian worship. Historians and students of early Christianity will find this commentary a valuable resource for years to come. Have you read the Gospel of John? Have you sang hymns? 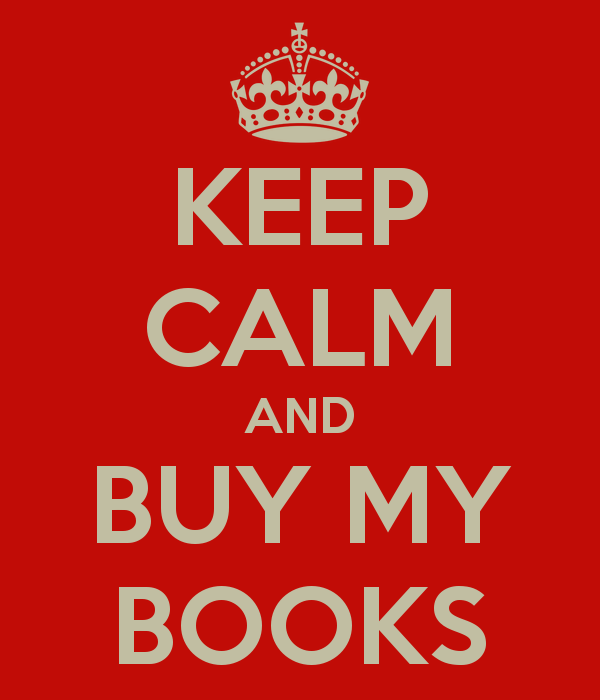 So did the author(s) of the Odes of Solomon. But, the Odes are much more important than that. To the researcher in early Christianity, they provide a window into an early community still struggling to piece together something new from something old. Not only does the Hermeneia series offer one of the few commentaries available for the Odes, but it does so as the entire series does with other books of canon and non-canon — critically, with attention to the details of the past. 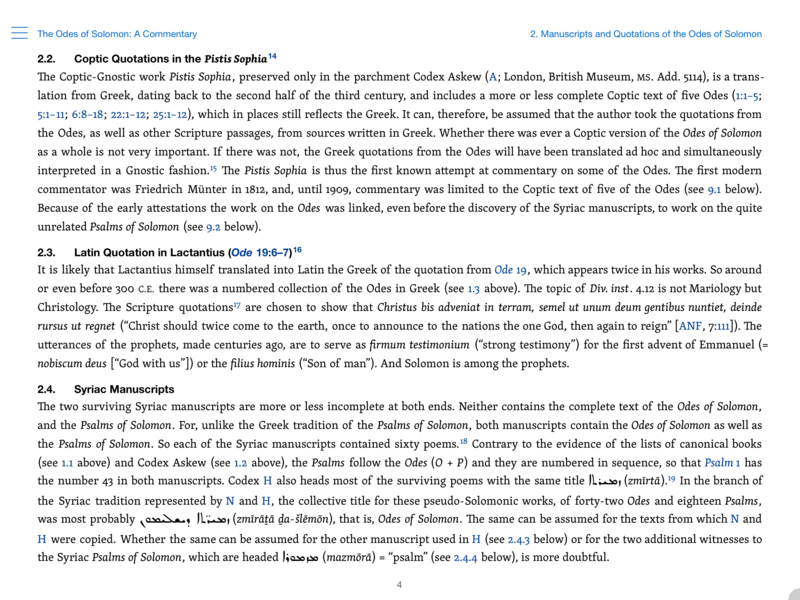 These details include a focus not only on the manuscript evidence but the context of the Odes as well; the connection between these hymns and the canon, but so too to the various translation issues arising from the fact that the Greek manuscript is more likely a translation from a previous language. Meticulously researched and assembled by renowned German scholar Michael Lattke, this volume allows the researcher to dig deep into the pre-history and transmission history of Odes. Lattke begins with a discussion of the early reception of the Odes, from its canonical as well as gnostic use. He discusses authorship alongside other pseudonymous Solomons and after much debate, assigns the the first quarter of the second century CE as the probable date. Lattke then proceeds to give some meaning to the Odes throughout pre-modern history (yes, the gnostics are included as well) and in early 20th century reception. We meet not only the Odes, but the scholars we do their best to present the Odes to us. Following this, Lattke gives us the commentary. 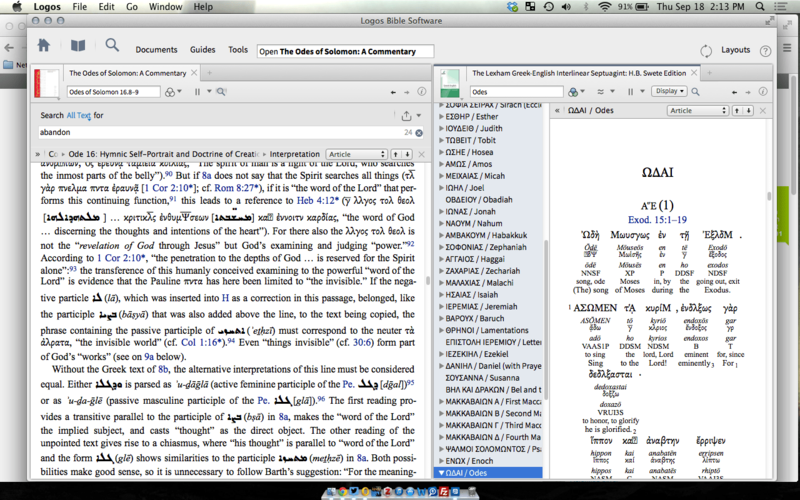 If you have never seen the Hermeneia commentary, then it may seem a bit daunting at first. However, once you master it, the layout becomes a tool to aid your reading. 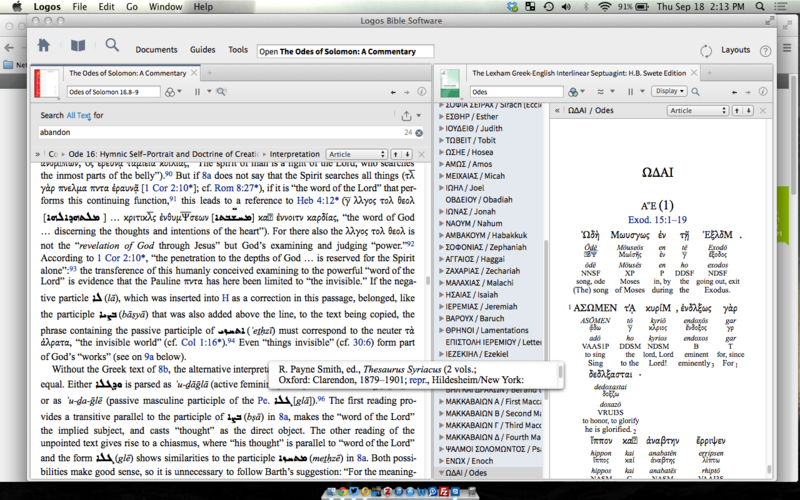 At the beginning of each ode (think chapter or psalm), Lattke gives his translation which is divided into the commentary sections. For example, Ode 20 has ten verses, but Lattke adds the ‘a’ and ‘b’ (ex. 1a and 1b, or 9a, 9b, and 9c) to the lines as he will examine then. There is an introduction, and overarching view,to the ode given first. Likewise, there is an interpretation which is the meat of the commentary section. 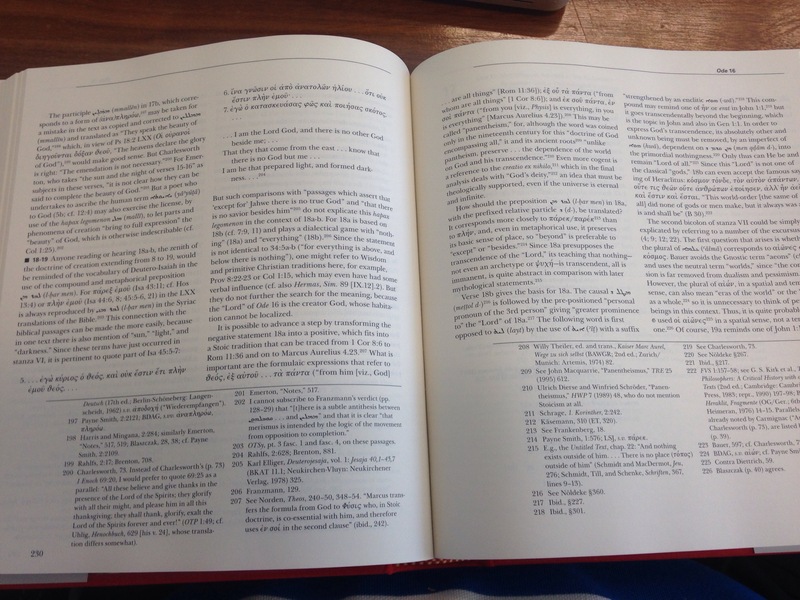 The footnotes are there as a separate, added, tool to the commentary, providing further reading and succinct explanations. Using Ode 20 as an example, I can point out the charts Lattke has included to help illustrate his points. Table 4 and 5 show the intertextuality between Ode 20 and the canonical books of Exodus and Isaiah. Following this is an excursus whereby the author presents something unique to the book, but drawn from the ode. Again, I use Ode 20. Here, the excursus examines “soul” throughout the book. This volume is essential to the study of the Odes, if not understanding early Christianity and reception of wisdom traditions. 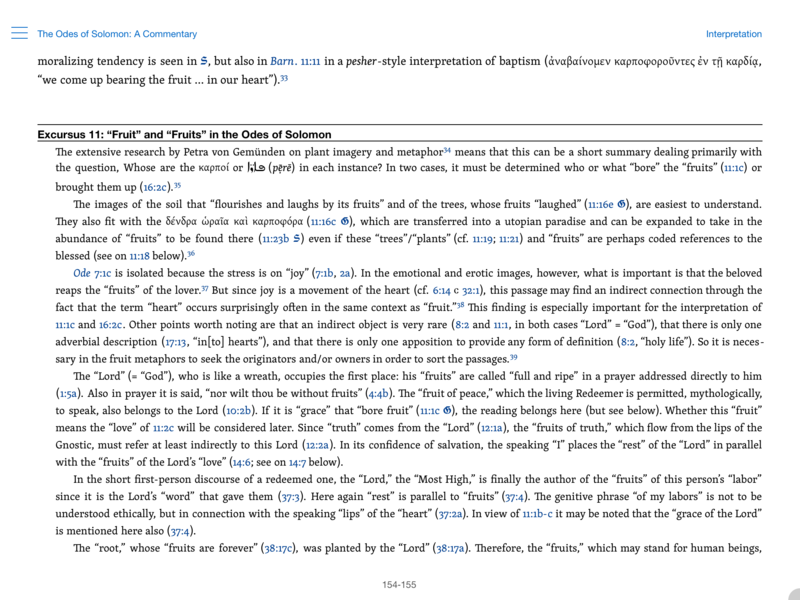 The Odes of Solomon volume is included in the New Testament collection on Logos. I’ve attached several shots from the Mac version as well as the iPad version. Previous What if the #UMC blogosphere were characters in Tombstones?